So I did. And over Schuyler County, here’s a cell with a plausible tornado signature (a hook) on radar. 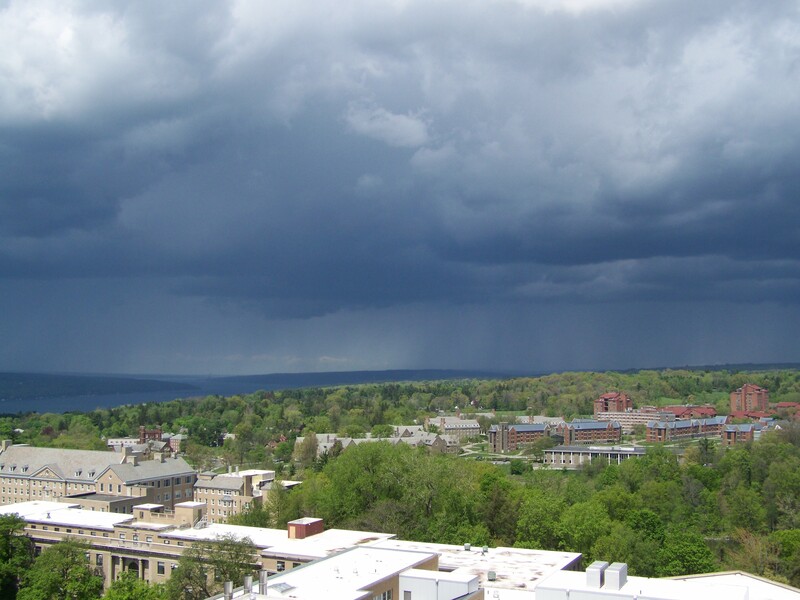 The cell was tracking northeast and Ithaca was directly in the warning path. So, an unusual and rather scary night for the folks back in Tompkins County. Digging into some data, I decided to check the last time a tornado was confirmed within the county. Although the project suggests otherwise, conflicting reports suggest a fatality with the August 28, 1988 tornado. That tornado, an F-1 (today we use EF-1, as the Fujita scale as been refined to become the “Enhanced Fujita” scale), may have killed one person. Further analysis suggests this tornado tracked from Schuyler County into Tompkins County, and the fatality was in Schuyler, which might explain the disparity. I don’t know the ratio of warnings to confirmed touchdowns, but Brotzge et al. (2009) suggest only 1 in 4 warnings result in confirmed tornadoes. EDIT: Actually, that link won’t work for most people unless you have American Meteorological Society connections. So, events like this are rare indeed. My only regret is that I should’ve saved the radar imau ge from last night. Actually, I have two regrets. My second is that I have a friend who photographed the King Ferry tornado a few years ago from Space Science, and he sent me a copy of the photo back in 2007, which I lost at some point. If I feel really proactive I might email him to ask for another copy.